Numerous Tondekai (Ivy Gourd) creepers swayed in the gentle breeze from a fence which separated a narrow path which ran along our compound wall and the mango trees at the bottom of our garden. The abundant fruits which they produced were left to the birds which flocked our garden, and to us, their only competitors. We munched away the small watery vegetables as we played hide and seek or marakoti in the garden. The ones which escaped our attention, ripened into blood red coloured fruits, full of juice. 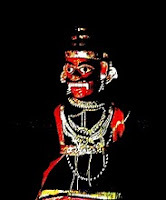 Tamil poets down the centuries, up to the modern ones have used this fruit – the kovai pazam – as a simile to describe the full red lips of the Nayakis or the heroines. In those days, as a new bride, I was surprised to see my mother- in - law buy this vegetable along with the other vegetables in the market. I was even more surprised when I tasted them in our usual sambar and curry. After all it was delicious. Recently I happened to read in the newspaper about the role played by this vegetable in controlling the blood sugar level in diabetics. The very next day the price of this vegetable soared up to new heights!! 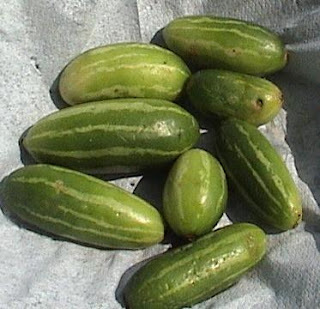 Tondekai (Ivy Gourd) – 500 gms. 1. Wash and cut the tondekai lengthwise into thin slivers, or slice them into roundels. 2. Heat oil in a pan, and add the mustard seeds. 3. When the seeds splutter, add curry leaves and the tondekai. 4. Add sambar powder and salt and blend well. 5. Cover with a lid and cook over low flame, the vegetables releases enough water to cook it its own steam. 6. Keep opening the lid now and then to turn over the vegetable with a spatula. 7. When it is completely cooked, remove the lid and sauté for some more time till it gets roasted to an almost crisp texture. Enjoy the crunchy crispy and spicy tondekai curry with rice or rotis. For those who are diabetic, or simply health conscious, here is a method that’s uses just ½ tsp of oil! 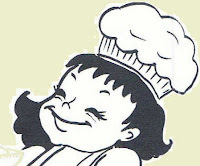 The ingredients are the same, except that amount of oil used is negligible! 1. Cook the tondekai in a pressure cooker. The water in the bottom of the pressure cooker is enough, and just a sprinkle in the vessel containing the tondaikai will do. Do not add more water, as you want the tondekai as dry a possible. 2.Next take ½ tsp oil and fry mustard seeds and curry leaves. Watch out, as it burns very quickly! 3. When the seasoning sputters, add the cooked tondekai, sambar powder and salt, and saute for few minutes, till the raw flavours of sambar powder disappear. Its now ready to serve! By using a pressure cooker, besides preserving nutrients, you will also save a lot of time in cooking the tondekai. This post goes to Sangeeth’s Eat Healthy Fight Diabetes event. You can read more details on how tondekai helps in controlling diabetes here. Funny :-) I was googling away for the English name for Tondekai, when I discovered that Australia considers this a weed, and has even issued alerts! The main reason is that this grows abundantly, smothering other vegetation! I can see the comments section clearly on my machine! I am getting tired of the limitations with ready to use templates....need something more flexible!! The first method is the way I like it best. Btw, like LG said, it is really hard to see the "Post comment" link. 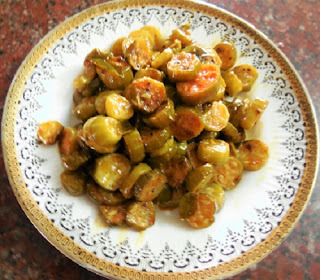 This is one veggie I miss here..We rarely get these in the Indian store..nice recipe. Jayashree - yes, that's my fav too! Cham - I tried to fix it in the html code. Hope its showing okay now! Thx for letting me know. Divya - So true! I ran a search on 'buy ivy gourd US' and landed up finding ivy gourd extracts sold in health care stores!!!! I meant to say steaming is the best way to make healthy palya. I cannot see few of things like post coment, etc may be it is because of color. You can change it in layout/Settings where there is option to change the font colors, size, shape, etc. We call it kovakkai, and I really really like it. And curry is exactly what I make with them too. wow! This is called tinda in north india, right? Seems quite yummy... I never knew how to make a curry out of this veggie! But now I do! Hello Roshni - I think Tinda is some roundish veggy. 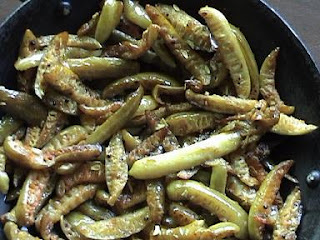 This one is called Kundri in Bengali, and Tindora, TindLa, Tondli etc in the North! tondekai is my fav veggie. 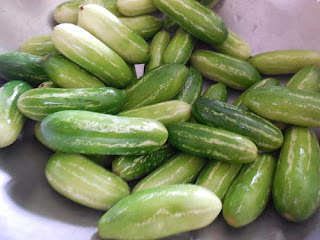 I think the name for thondakai is gherkin? Jadu - yes its a fav for many! Jinny - This is not a gherkin, although it looks similar. The taste and texture is also slightly different. Gherkin is more of a tiny cucumber. I found wikis for both! Tondekai or Ivy Gourd is called Coccinia indica, whereas Gherkins are called Cucumis sativus! I like thondekai. Though it is considered weed around my parts...people use its leaves to go into their greens masiyal! Something peculiar! Tara wanted to have some different "exotic" vegetable. The Indian store close by had a whole fresh supply of Tondekais & Tara pounced on them. Yummy - tondekai curry roast for dinner last night - thanks to your recipe.